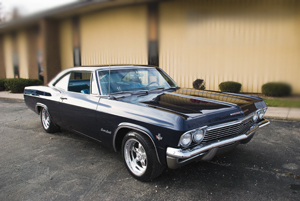 Ken Harrison Enterprises bring the audio in this 1965 Chevy Impala into the 21st Century. Tom Baumgartner has owned the 1965 Chevy Impala pictured here since he was 16 years old. It holds a cherished place among the cars in his collection and after a complete restoration that took more than five years, it’s a car he loves driving when weather permits. But after dealing with a period-correct AM radio, he finally decided that it was time to upgrade the audio system. For that, he turned to Ken Harrison Enterprises of Texas for the components for a non-invasive installation that left the Impala virtually untouched. Many classic and special interest car owners are reluctant to make any permanent modifications to their cars, especially in visible areas like the interior. This makes it difficult to install modern car audio components, especially head units, as most of the mainstream manufacturers (Alpine, JVC, Kenwood, Pioneer and Sony to name a few) discontinued production of traditional shaft-mount radios almost two decades ago. This has left this small niche market to be served by specialty manufacturers, and among these companies, Ken Harrison is held in high regard, especially within the classic Chevy community. For this installation, Ken Harrison supplied with their shaft-mount 200-watt KHE-300 AM/FM head unit with front and rear auxiliary inputs (suitable for MP3 players and external satellite radios from Sirius and XM). The KHE-300 is the control center for the system and features adjustable shafts and a small nosepiece with an analog station display with a digital clock that fits through the factory opening without any modifications. The control unit for the separate trunk-mounted FM-modulated 12-disc CD changer would be mounted by installer Josh Perkins in the glove compartment for a stealth-looking installation. Rounding out the installation would be the replacement of the single mono in-dash speaker with a pair of smaller 3½-inch speakers mounted on a plate. While the rear-mounted 6 x 9s would provide the system with much better fidelity, such as the ability to play loud enough when driven by the 50-watt-per-channel four-channel amp built into the KHE-300. If you have a classic Chevy and want a non-invasive installation of a modern audio system, check out the line of available components from Ken Harrison Enterprises of Texas (www.oldcaraudio.net). Available for many classic Chevys, these components are also sold by independent retailers. 1 The starting point for this classic Chevy audio upgrade is straightforward: a traditional full-size Sixties GM dash. The radio and glove box have already been removed from the dash of the 1965 Impala. 2 Here’s the replacement KHE-300, a traditional shaft-mount radio with a separate nosepiece, designed to fit the Impala’s radio opening with no cutting or modifications. 3 Installer Josh Perkins is getting the replacement 3½-inch speakers mounted and wired, replacing the single monophonic speaker. This needs to be completed before mounting the new radio. Having the glove box already removed makes this task much easier. 4 Josh prepares the power and ground leads. Unlike the original radio, the KHE-300 will require a new lead, wired to a constant 12-volt source, to power the KHE-300’s built-in clock. 5 Now we’re making progress, a test fit of the new radio. This is essential: given that the mounting points for each shaft are different, requiring a different stagger for each, an adjustment made by nuts and washers on each shaft. 6 Once the mounting of the radio is confirmed, it’s time to tighten up all the screws that attach the original trim bezel to the instrument panel. A stubby screwdriver makes short work of this task. 7 Now that the radio is secured to the dash and the knobs are installed, the KHE-300 looks as if it was designed by the factory for the 1965 Impala. 8 Since new rear speakers will be installed, Josh starts the process of running new speaker wires, starting at the back of the radio and running the wires under the carpet to the rear of the car. 9 This step is more crucial than it looks. Make sure that when running the wires to the rear, you don’t accidentally screw through the speaker wires or any cables, such as for a CD changer, when you reinstall the threshold plates. 10 With all the wires and cables run front to rear, Josh has started to install the control unit for the trunk-mounted CD changer in the Impala’s glove box. 11 The controller for the Pioneer CD changer, the output of which interfaces with the KHE-300 via an FM modulator through the antenna input, is installed in the glove box. 12 The CD changer will be installed under the rear deck, requiring Josh to show his abilities as a contortionist. 13 After the brackets have been attached to the CD changer, the entire assembly is secured to the underside of the rear deck. 14 Once installed, the CD changer is unobtrusive, yet it’s easy to change the 12 discs loaded into the cartridge. 15 Believe it or not, the Impala has provisions for two 6 x 9 speakers, which can be mounted from the top with the supplied grilles – as shown here – or from the bottom for a more custom appearance. 16 With all the components installed, we’re ready to test the system. Note the front panel AUX-in, suitable for use with a portable MP3 player or even an external satellite radio tuner. 17 The KHE-300 looks as if it could have been factory-installed back in 1965. 18 The Pioneer CD changer package is supplied with a credit card-sized remote control, which can be used to access the discs in the trunk-mounted changer. 19 Once the glove box door is re-installed and closed, the installation of the controller for the CD changer is totally stealth. This is a truly beautiful car and I am kind of jealous that you were able to rebuild the stereo in it. Did you have to do anything with the sound deadeners to compensate for the increase in sound? Thanks for the post! You guys are really cool. I wish I could revive an old Stanley chevrolet from gatesville like you did. Yeah i agree with you, its really very cool for us and good to know about that actually i love these muscle cars and their look is very awesome and professionally i am a mechanic and know well about the interior of these cars. Good work done on this blog, its really awesome.However if you want to check the Vin of your car so have a look on Mercury VIN Decoder.